I recently payed a visit to Westfield Lakeland Park situated in the small village of Fitling in East Yorkshire. This was my first visit to the venue for many years, and to say it has changed a bit is an understatement. Originally when I went, there was only 1 lake and that was it. Now there are 3 well stocked lakes, as well as a cafe/ tea room offering excellent food and service. There are also high class lodges on site to rent; many with there own hot tubs! If you rent one of these lodges you will also benefit from 1 of the 3 lakes to yourself, as this lake is reserved for lodge guests only. Lake 1 - This is a long thin stretch of water with depths between 4ft - 6ft, covering over an acre, with fishing from both sides. It also has staggered pegs to avoid being directly opposite another angler. Lake 2 - The larger of the 3 lakes which boasts over 2.5 acres, with depths between 4ft - 6ft including a target central island. Lake 3 - Has a circular contour, which has a target islands with depths of up to 12ft. The fishery is stocked with a wide variety of fish including: Carp, Bream; Tench, Ghosties; Rudd, Roach; Perch, Barbel and Chub. The lake I decided on fishing was Lake 2. Almost every peg has access to a part of the island, which is around 20 meters away. 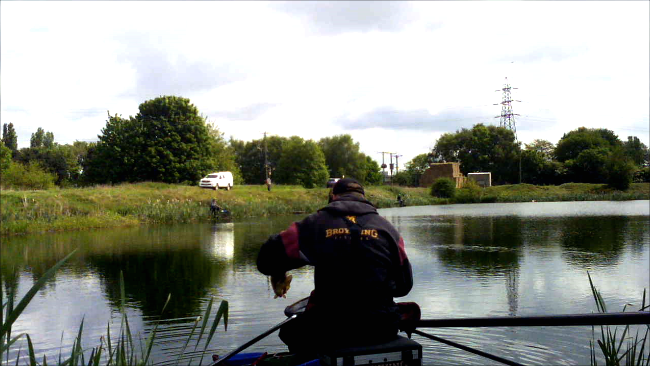 The peg I picked was half way down the right hand bank which backs onto the lodge lake. My plan was to start on the method feeder tight up to the island, and then switch to the pellet waggler if the fish backed off from the method feeder. I also planned to fish a line down the margin to my left as it looked extremely fishy. For the method feeder I had some 6 mm hard pellets for the hair rigged band and for feed I had some dampened micro pellets. For the pellet waggler I had some 6 mm hard pellets for both the hair rigged band and for feed. For the margin line I planned to feed ground bait and alternate between corn and paste on the hook. I started the session on the method feeder; I baited up with a 6 mm hard pellet, then used the mold to form the softened micro pellet feed around the feeder. Before casting I always give the pellets an extra squeeze by hand to further compact them, so the feeder reaches the bottom with the pellets intact. I casted the feeder tight to a small section of earth that had fallen from the island. I managed to catapult 2 small pouches of 6 mm pellets over the top before the tip was dragged round. After a short battle I soon landed an immaculate Ghost Carp. The next 6 casts to the island produced a constant run of fish. I had started to notice that when I was feeding the pellets over the top, fish were starting to swirl. I immediately switched to the pellet waggler, which resulted in 2 hours of none stop action. I was catching mainly Chub and Carp along with the odd small Skimmer. The wind then changed and turned completely the opposite way, This had a dramatic effect on my catch rate as the Carp and Chub disappeared and more and more Skimmers moved in. This prompted me to try the edge line that I had fed with 3 pots of ground bait 15 minutes earlier. I started with corn on the hook, but all I could catch was Rudd and Roach. I could tell there was bigger fish there as the float was moving about all over. A switch to paste resulted in a much more positive bite. I lifted into the fish and this was followed by a steady stream of elastic heading towards the centre of the lake. After a 10 minute battle, I managed to net my biggest fish of the day, a Carp around 8lb. I re baited the hook with some more paste and had another look down the edge but the result was more Rudd and Roach. 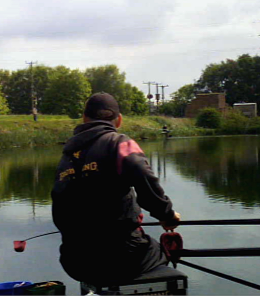 A change back to the pellet waggler resulted in a really forceful bite, I was getting dragged about all over the place. I had a feeling that I may have foul hooked a Carp. But when the fish surfaced close to me it wasn't foul hooked or a Carp, It was a pristine Barbel and a decent one at that! During the day I had seen a few Carp topping further down the island, so I swapped the method feeder over to a bomb, and took some 8 mm pellets from my bait bucket. 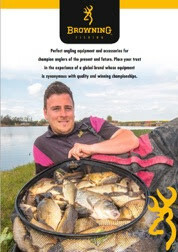 I catapulted 3 or 4 pellets toward the area I had seen the fish, then cast the bomb over the top, The last hour was mental, the bomb was hardly hitting the bottom and the rod tip was ripping round. I was again catching plenty of carp. 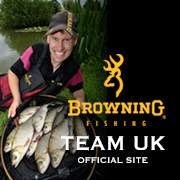 At the end of the session I must of had around 100 lb; what a lovely days fishing at a cracking venue!